A baker�s dozen of basic bags each with two and sometimes three variations of each are packed into �Carry With Style�, a follow-up to the successful �Handle With Style� book. 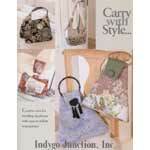 There are many bags to make in this book, including purses, duffle bags, tote bags, and even creative diaper bags. There is even a great bag made from a placemat that has a lot of style. The use of fabrics, handles, and trims are used in ways that make each bag a very up-to-date and stylish addition to your wardrobe. There is one called the �Rachel Bag� which has a triangular shape that you actually get into through a zipper in the back. Included in the book are instructions for fabric selection, closures, pockets, using images from CDs, handles, special finishing touches, and resources for finding the hardware and supplies for completing the projects. These bags are so much fun to make � try them! Here�s betting that you will make a bunch of them for yourself, friends and family.